Part 2 of our holiday started with the journey back down towards the coast and to the famous Keralan backwaters. On the way down we stopped at the Connemarra tea plantation in the Western Ghats, and learned how the tea is harvested and processed. 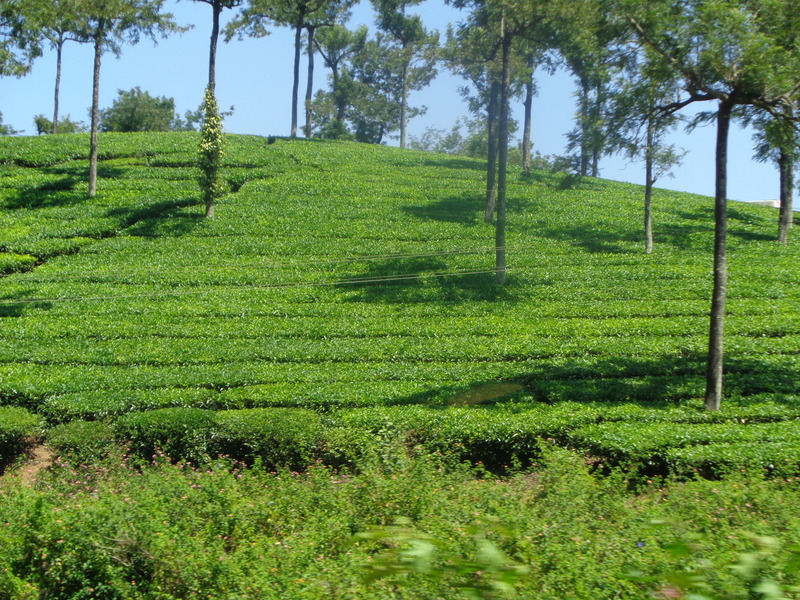 The machinery looked so old, it could have been Victorian, with a huge furnace to power the conveyor that sorted dried and crushed the tea leaves, the leaf size decides the teas’ use, with the almost powder ending up in tea bags. However this does not alter its taste. Our small group of 4 politely watched an old power point presentation shown on the bare wall, sat in a semicircle. 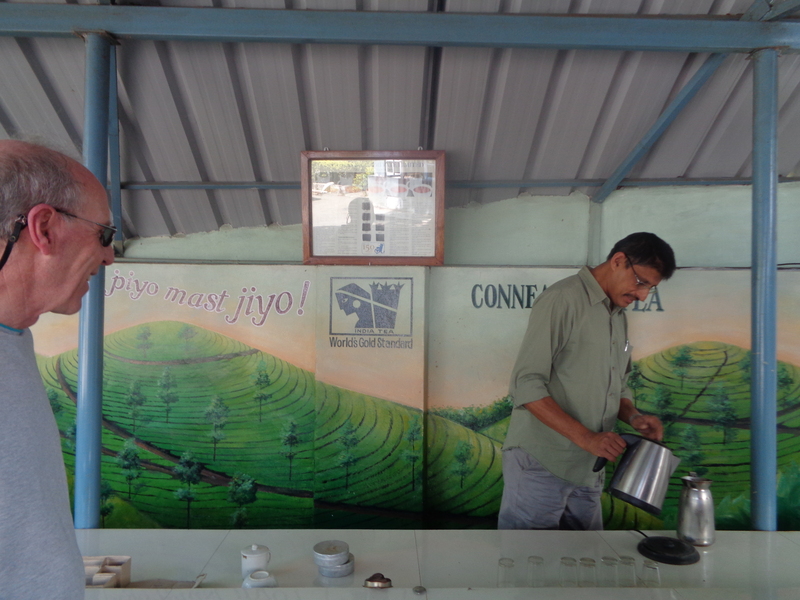 The visit ended with a tea ritual and a black sweet brew was served to revive us! Restored, we climbed back in the car for our dizzy descent down the twisting road. The trip was beautiful with the route down through the deep valley. Our arrival at Kottayam came all too soon, but I was allowed a quick shopping trip in one of the many wonderful fabric shops and managed a few purchases! Our car arrived at the jetty for our river trip to our next destination, The Coconut Lagoon. I thought I had arrived in paradise! 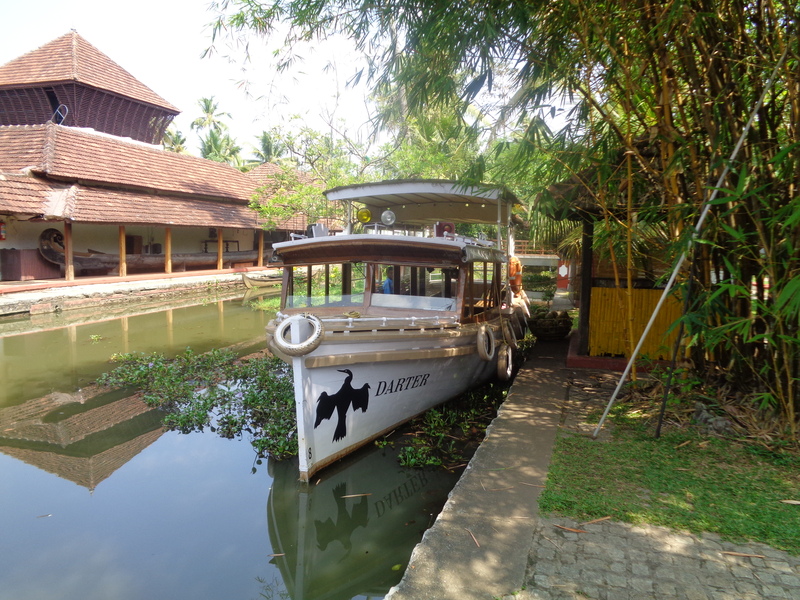 The hotel is built along the largest expanse of inland water in India Vembanad Lake and its backwaters. You feel totally relaxed and in another world with no car or motor noise of any sort. Leave me here I thought, though I knew there was more to look forward to. 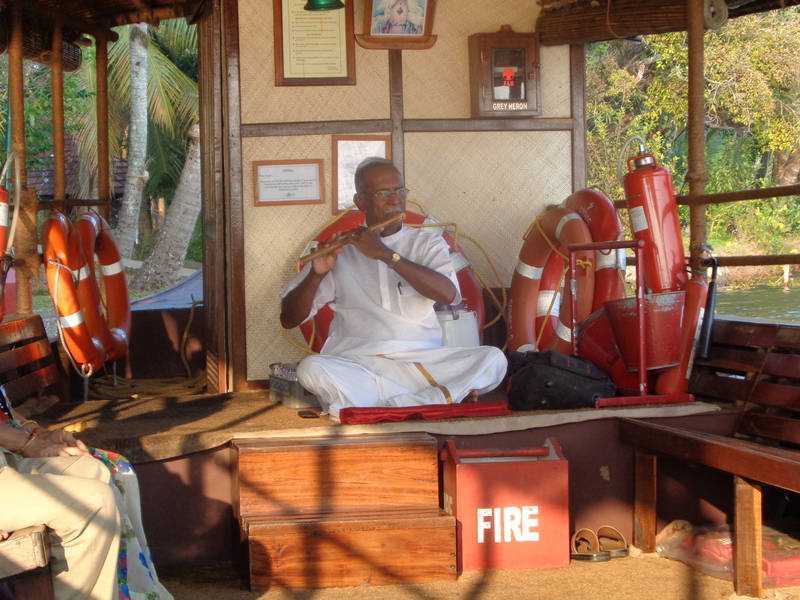 We took a sunset tour of the lake to the accompaniment of a flute player, so mystical the experience stays with you for days. 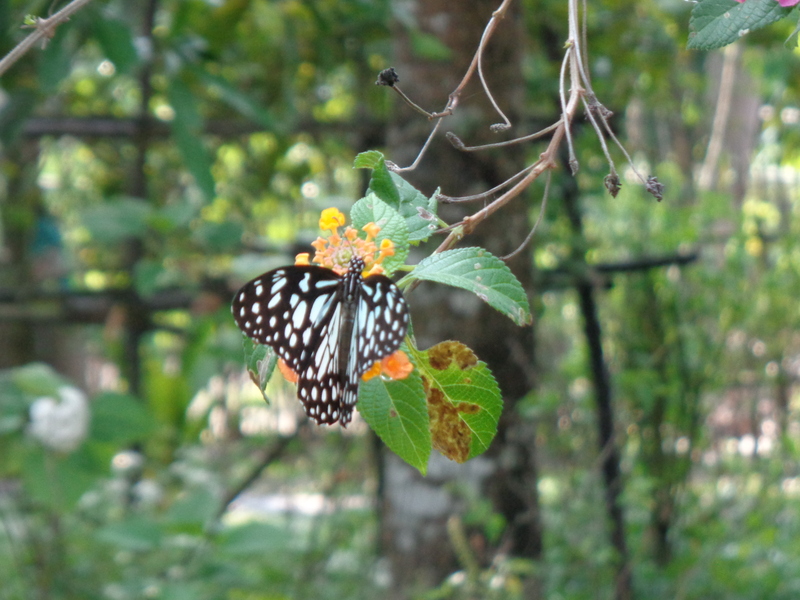 We were taken around the vast grounds and butterfly gardens by very knowledgeable guides, proud to show off their efforts in conserving and promoting their passion for their surroundings. 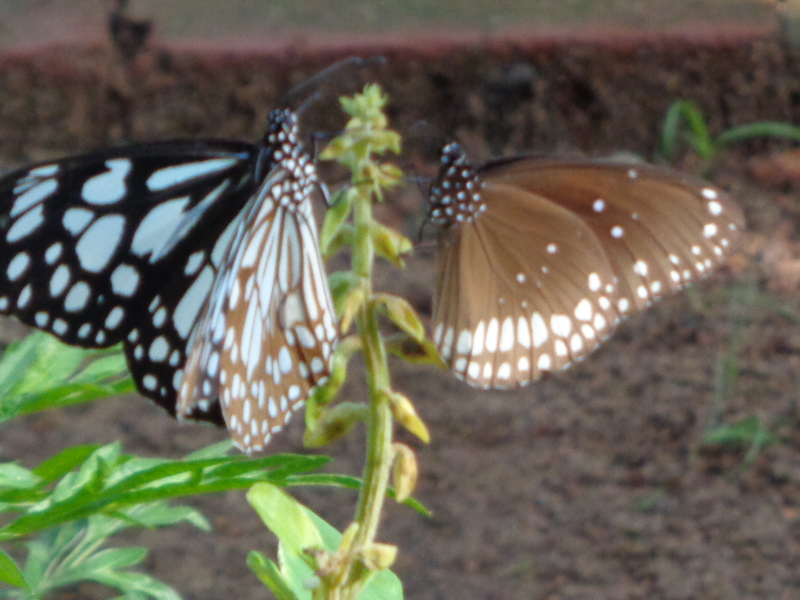 Our accommodation throughout our stay has been totally in keeping with our surroundings. No high rise buildings or ugly concrete the resort sites have been very carefully planned and designed using the original buildings and features that gave the area its character so many years ago. A couple of days and our visit to Coconut Lagoon ended and we went sailing away on our taxi boat The Darter to the last stage of our holiday.